Paper Smooches DT Blog Hop | A bit of this. A bit of that. It’s Pep Rally Week once again in the Paper Smooches world, and the design team (and friends) are here today to share a sampling of the NEW Paper Smooches JUNE release with you! FOUR new stamps and EIGHT new dies will be available to purchase on May 31st at 8 p.m. Pacific Time. Once our release goes live, you will find our new products HERE. The prize – a $25 gift code to choose what you like at the PS online store. Deadline: You have until midnight PT on Sunday, May 31st to leave a comment. Please check the Paper Smooches blog on Monday, June 1st to see if you are one of the FOUR lucky winners. A couple of our designers are taking a small hiatus to care for different things in their life. Julia Stainton is filling in for Emily and Kristina Werner is filling in for Pamela. We are so excited to have them join us in June! Alright, so enough hop talk! Let me show you what I’ve got. I used the brand new Notebook Paper Two stamp set to stamp the lines on the little piece of paper. I also stamped some of the words (“you” and “and”). The rest of the words, as well as the stars and the little boxes were stamped with the new Clipboards Two stamp set. I’m always a fan when products work together, and those two sets work together well. The paper was die-cut with the Paper die. Just a really practical die. I’ve been using it a lot lately. OK! So that’s what I have for you today. Thank you for swinging by! I do like that die, really would be practical. Thanks for sharing! I shared the hop on Facebook. This is so fun Teri! Love the big clipboard! Really cute card using office supplies! My favorite place to shop is an office supply store even as a child. So I’m loving these stamps! Such a cute card to leave the kids on a special school day. Love the paper die and the clip die! Adorbs! your card makes me HAPPY! great color choices too! A fun happy card!! Love how bright and cheerful it is. Cute card! Sending a lot of hugs makes anyone’s day. I love this! The refill die is on it’s way to my house so thanks for the inspiration. Fabulous fun and giddy card! Great work! That notebook paper is adorable. I could see getting a lot of use from it. What a Bright Fun card!! Wouldn’t this be a great “office” or “teacher” card. Love how you’ve layered it. A fun die and card. A great inspiration to get that die. Love it! Very cute. Like the School paper look. What a great card! I can create cards all day but I’m terrible about writing my feelings. So I always say I’ll give hugs until those feelings are gone so this card inspires me to create! Teri this totally checks all my boxes! Really love the bigger holes in the note die … ooo you are gonna make this tough! Very cute card … looks like I have more to put on my wish list. Can’t wait to see the rest of the release. Great card! I love it when stamp sets work well together, too. You’ve covered all of the bases! great card. Sending you Love, love and love for this card! Cute card!! That die is awesome!! cute! that would make a cute teacher card! Yes, these sets are perfect together–love the card! Your card was just super cute! What you did for the clipboard was genious I have to say…made it yours and unique *wink*. I commented on FB and Twitter about the blog hop! Fabulous design. Love the cute sentiment on the notebook background. Great card–love the paper die and all the details just make the card! 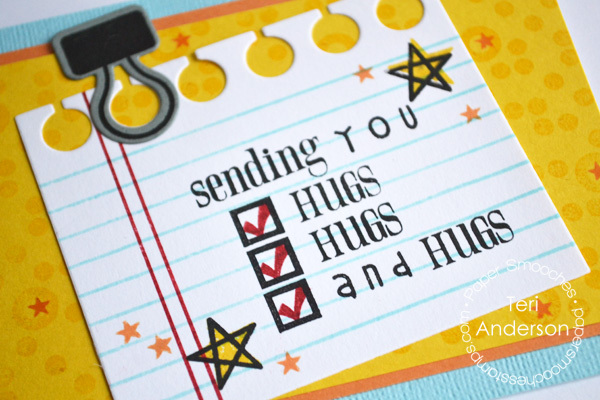 How cute is this card and I love to send hugs to my friends! So cute!! Love the simplicity of this card! Such a cute card – perfect to send to my grandkids! LOVE those bright colors on your card! I love this card. What a great way to brighten someone’s day. Such a Beautiful Greeting, I love it! Someone special is going to love it, too! I really like the dies and the paper stamps. They really do work well together. I am in love with the new releases. LOVE. Will add them to my next order. A very FUN card! Love the bright colors and awesome sentiment! Love the list sentiment, and on notebook paper – perfect touch! Great card, TFS, Teri! Hehe – such a cute card. Such a fun and cute card! Your card is so cheery. Looking forward to see all the stamps and dies for this release. Love that paper edge! Such a happy card! Great looking card. I love the design you used. I also tweeted about the hop. I love this card; it would be a cute concept for a teacher card. Great design and love the way you customized the sentiment. I posted on FB about the hop. Adorable Notebook card, love the layout and color combo! Love the die. Very cool. Notebook is sooo cute and the paperclip. Oh MY! Love the sentiment and all the fun elements! What a great card! I could see a lot of teacher/student projects with these products as well. Thank you for sharing. Really cute layout and color combination. What a nice card – and I can easily see those stamp set used on a scrapbook page too! Great card. So much fun! Love is little “notebook” card. This new release is really fun and clever. Your card made me smile, great design! Cute card! Love the little tick boxes! A bit of Whimsy! So cute! I love this and so would my granddaughter. Delightful and sweet!! The paper die sure looks like lot of fun to play with. Your card is sooooo cute. Thanks for sharing. Thanks for sharing your considerable talent with us! I love this paper die and I think I would find a lot of uses for it. What a great creative use of the notebook die! Sometimes I am at a loss as to how to use those things! That card is bound to make people feel loved. What a cheerful and happy card! Love it! Oh I forgot to let you know I shared the blog hop on FB, and twitter. It has been a pleasure to visit each blog. Thank you ! Love this stamp set and how you used it. TFS. Would love to get dat hug!!!! Great choice for this blog hop. I love this card. Thanks for sharing your creative ideas. So fun, I always love your use of color! Love this! So super fun! Fun card that can be used for so many different occasions!! love that!! What a wonderful card…I love that die and stamp! So cute! and I tweeted: https://twitter.com/TenSGal/status/604298858198245376 Thanks for the chance at the awesome giveaway! Love all the color you used for this card. Bright and cheerful! Thanks for sharing. Beauty of a card! Looking forward to the new releases! Great card, love the fun and bright colors. Thanks for sharing. I actually wanted to write the exact same comment as above: fun, fun, fun! This card is adorable! Wow! I tweeted about the blog hop! So creative! Thanks for sharing your creative ideas. What a fun card … love the color combo and that ‘list’ is so cute. Great job! Ooh, that Paper Die looks like fun! Love the paper die, such a brilliant idea, especially for layering. Fantastic card!! Very cute card! I think I know this paper, is it one of the old collections of Lawn Fawn? This works wonderfully with the notebook paper. I posted on my FaceBook page about blog hop. I posted on my blog about blog hop. So cute! This would make such a fun lunchbox note. I posted about the hop on my blog today. Love your style! So cute! Very nice card – looks like a page out of a notebook! Super creation! Loving the die – thanks for sharing – have a blessed week! Oooh I LOVE this … the sentiment is fab! What a fun card! I love the sentiment so much, thanks for sharing! Adorable!! That sums it up in a nutshell!! That is so sweet. I love the sentiment! Love it! Great Hugs!! I need both of these dies, the little paper and that clip. LOL Both fun! Thanks! What a fun way to send HUGS!